As many of you maybe know, HS, Yogyogibear, Terri, Myself, Miki, and other readers and commenters here consider ourselves to be DEAN DEMOCRATS. 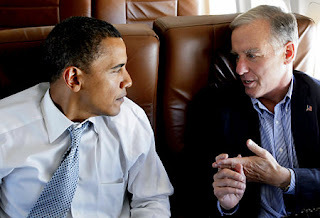 We became activists because of Howard Dean and his people powered politics! You can read Tokyo Terri's -Thank you post here. Earlier this fall, Dean conducted a voter registration bus tour that hit 22 states. Party insiders, who once criticized Dean’s 50-state strategy of building up state party operations in even the most Republican of states, now laud the strategy for boosting the party’s fortunes. Dean’s said he was gratified that Obama had borrowed some of the techniques Dean employed in his presidential campaign, including a reliance on small donations and use of the Internet. “I told David Axelrod ‘You took all the things in our campaign that worked out well and used them, and with anything that didn’t work out, you got rid of it,’” Dean said. Axelrod is Obama’s chief political advisor. Thank You, Howard. You were right. And we will always be your Dean people.